eBay is debuting a number of new, connected digital storefronts for shoppers today at the Westfield Mall in San Francisco. Similar to the marketplace giant’s shoppable windows in New York, this new partnership melds connected glass, mobile technology and digital payments to give Sony, TOMS and Rebecca Minkoff shoppers the ability to buy from these digital storefronts in the Westfield San Francisco Centre. Shoppers interested in buying or browsing from these storefronts can touch the glass, and select from one hundred of items of merchandise from Sony, TOMS shoes or fashion designer Rebecca Minkoff. If they choose to guy any items, they can proceed to checkout by pushing the order to their mobile phone. Shoppers can either enter in their phone number into the glass and receive a text message to complete payment on their mobile phone. They will be sent a short code URL and can pay with either PayPal or credit/debit cards. 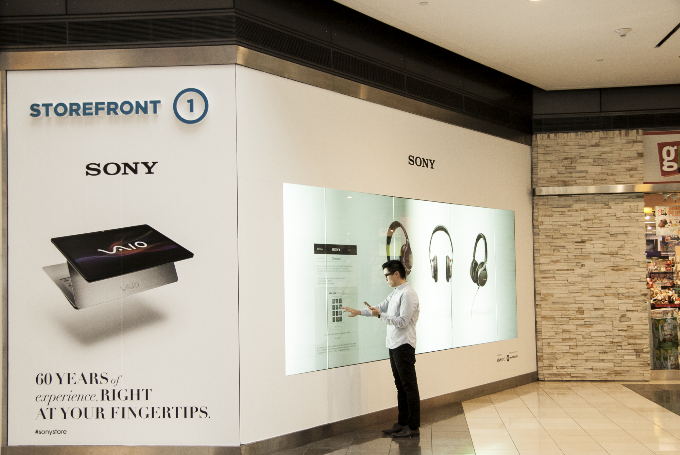 Shoppers can arrange for free home delivery or pick up the Sony merchandise at the Sony Gallery in the mall. For eBay, this is a way to bring its retail technology to the offline experience. As CEO John Donahoe told us earlier this year, eBay wants to bring itself closer to where retailers are still doing the majority of their transactions, offline and in-stores. The storefronts, which will be setup from November 20 – January 12, represent an interactive way in which eBay could possibly accomplish this goal, and collect compelling data on in-store shopping behavior and more. eBay tested a similar venture with Kate Spade in New York earlier this year. A few years ago, the eBay team partnered with Toys ‘R’ Us to add an in-store touch screen as a search bar and a filtered gift finder, both of which led to a search results page of products in stock, sorted by what’s selling the best. It then gave users a map that they could push from the screen to their phone using a QR code, coupons included. The new Connected Glass screens installed in the Westfield mall have two films, one which projects high-def images, and another which turns the glass in front into a touchscreen. The glass can be up to one inch thick, allowing for more permanent installations, if called for. The screens also offer induction speaker technology to make sounds, designed to give you a similar feeling as you’d get if shopping from your smartphone. More importantly, the screens give eBay and retailers alike the ability to collect metrics surrounding the shopping experience. The screens can actually monitor shoppers up to 15 feet away in order to track how many people pass by the screens versus how many stop to shop, among other data points. Retailers participating in the launch will also have access to things like engagement metrics, and actions taken by shoppers tapping on the screens, in addition to, of course, sales data. Meanwhile, eBay is helping to monetize its efforts using a hybrid business model, we’re told. With this new model, eBay gets a fee when shoppers click on a product, and, like eBay’s traditional model, it’s also success-based once shoppers make a purchase. It’s not clear yet whether these storefronts will ultimately engage the in-store customer and translate into real sales. But with the touchscreen, eBay can at least measure and track whether customers are even interacting with the storefront. And if they are, and making purchases, this could be a new way for eBay to mark its presence in the offline world.